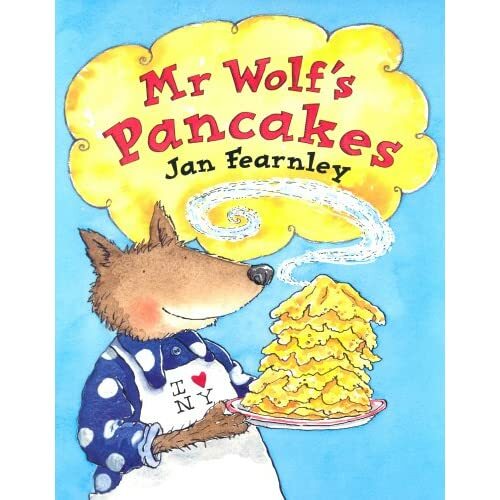 A great re-released picture book to look out for is ‘Mr Wolf’s Pancakes’. Of course it may have been more appropriate to post this BEFORE pancake day but as usual, life got in the way. In my opinion pancakes should be enjoyed frequently and this could be the next best thing to actually consuming all that sugar. In fact, The Bookseller has reported that sales of this book shot up to 500 per week around the time of pancake day, averaging about 8 a week throughout the rest of the year. Mr Wolf already has two other picture books out titled ‘Mr Wolf and the Three Bears’ and ‘Mr Wolf and the Giant Turnip’- both a worth a read. Written by Jan Fearnley (I always think ‘Fearnley-Whittingstall here of River Cottage fame- food is on the brain) these books have a great homely feel about them as they draw upon existing fairy tale and nursery rhyme characters such as Little Red Riding Hood (yes, her again) and my favourite; the gingerbread man. The book kept me guessing about the wolf’s behaviour throughout. Traditionally the wolf is seen as big, bad and not to be messed with so it was refreshing to see him struggle with everyday things such as shopping and baking. In all honesty, my heart went out for him and I was rooting for him the whole time. This is a lovely book to add to the collection if the kids love their classic characters. Coming this weekend a feature on ‘dark theme’ picture books. With the influx of the ‘dark fantasy genre’ (meaning Twilight, True Blood and Blue Bloods) I’ve looked into the representation of this new genre in the children’s age group. What might be quite interesting to discover is that there are many picture books available with a dark residual theme in them. Don’t get me started on the fairy tale themes and walking into the woods, but there seems to be a recurring and very real theme of danger in picture books recently and I review their effectiveness and once again, the issue of age group appropriacy. One picture book which particularly caught my fairy tale induced eye is ‘Darkness Slipped In’ about the threat of the dark, or at least the perceived threat of the dark. And of course ‘Into the Forest’ by the most wonderful, Anthony Browne. A re-telling of Little Red Riding Hood. Check back Sunday for an in-depth discussion. It’s probably about time I reviewed the winner of this fantastic prize. Whilst ‘Seven Sorcerers’ by Caro King didn’t win (if you remember my colleague John was representing it at the event) book sales from all the finalists have done very well. The winner ‘The Great Hamster Massacre’ by Katie Davies has no doubt fared the best in all this. 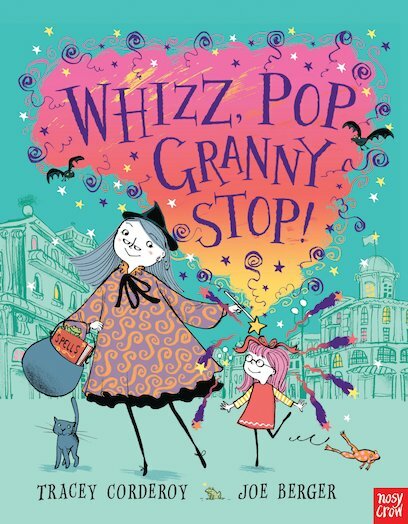 Publisher Simon and Schuster are winners of this prize for the second year in a row so they must be over the moon for Katie. The win has not come without some controversy though as there have been debates on both the Waterstones and Bookseller website regarding the appropriate age recommendation for this book. It has been classed as a 5-8 book and because of this a lot of people have suggested it’s just far too young and the content is not suitable. This ‘content’ they refer to deals with death…erm a hamster massacre to be exact. I digress. What I want to suggest to parents is, read a chapter of the book before you read it to your child if you are worried, seek out children’s booksellers and seek out book guides which are available in most bookstores and utilise the internet- there are so many informed reviews out there you really can’t go wrong. Most importantly, take a leap. Trust in a piece of writing, trust that you are doing a good thing getting your child reading and trust that your child may just like it. Katie Davies said herself that she based parts of the story on her own young experiences with a pet hamster, so if she survived and is still sane and coherent I doubt it can do much harm. (Look at the picture below taken from The Telegraph, she looks ok to me). Books are there for children to harness their imagination and let loose and they need to be exposed to all aspects of life- good and bad. What better way for them to learn than through reading? Katie Davies has produced a humorous, slightly gory but most importantly, a refreshingly honest account of life events and this achievement should not be taken away from her. Congratulations Katie, congratulations Simon and Schuster. I can’t wait for your next book ‘The Great Rabbit Rescue’. Can I just point you in the direction of the most wonderful blog I stumbled across the other day? After adding to my blogroll, I’ve found some corkers and I think this is my favourite. The blogger Jules is passionate and really involved in what she’s writing. That can be a bloggers downfall, I have found; writing with ease because of the anonymity. But this blog is based on ‘breakfast’ interviews with authors and illustrators which gives it a real arty vibe and got me inspired the moment I saw the Alice in Wonderland illustration. So please have a look through. It is well organised. I will be spending the rest of this rainy afternoon ogling at some illustrations wishing one day for a blog like that. Ok enough sucking up done, but I love this blog. Please, just visit and you will see. We all know how fascinated I am about fairy tales (and for those who don’t know, I focused my dissertation on them looking at the portrayal of the maturation process of girls) so any re-telling of a popular tale; of which there are many, will always grab my attention. Sara writes to be part of the ‘eternal conversation’ which I find a beautiful reason, and really seems to have a passion for what she writes about and the causes she is involved in. From a brief visit to her blog and personal website I can tell she very much recognises the importance of putting a child with book. So back to the fairy tale in hand. What’s refreshing about this Rapunzel tale is its modern twist finding that ‘happily ever after’ just means the story hasn’t finished yet. Rather than dealing with Rapunzel directly, we follow Cadence who feels strong empathy with Rapunzel as she feels trapped in a bad place. This story relies heavily on the readers’ perseverence as Cadence has to struggle with her father’s illness and her mother’s depression. Even as the possibility of that ‘happily-ever’after’ scenario fades, the spirit of Cadence keeps hope alive and the reader is rewarded. A wonderful read as Sara Lewis Holmes has demonstrated her ability to use a classic fairy tale and use it within an analogy that will resonate with modern readers. This is a gift sometimes lost on the Disney age. I love this series of picture books by Miroslav Sasek. Customers at work are always looking for books that will help their children on their first travels and I think these are a good starting point. (The Usborne ‘We’re going on a plane/to the dentist/to the vet/to a funeral’ etc books are also invaluable to a child’s first time experiences). On doing a little research there are loads of travel related picture books. My favourite would have to be ‘This is New York’ because I visited the big apple when I was only 16 and felt completely overwhelmed so can only imagine what it’s like for a small child. And for those not travelling; this is a great picture book to get the imagination going picturing fantastic adventures around New York. 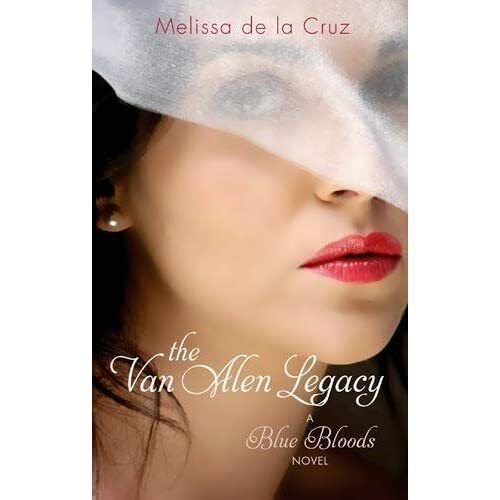 ‘Blue Bloods’ by Melissa de la Cruz. This is part of a series published by Atom and with a big marketing push, it is set to do very well. I’d place this in teen fiction and in the new ‘Dark Fantasy’ genre created at Waterstones. The first two in the series have already been published priced £6.99 with the third ‘Revelations’ and ‘The Van Allen Legacy’ both published 1st April 2010.